Anticipation is building nicely ahead of a Verizon and Motorola event on October 27 where new Droids will be unwrapped. The Droid Turbo 2 and Droid Maxx 2 are set to go official, and just recently we’ve seen a growing number of leaks and news about the smartphones. Now we can show the Droid Turbo 2 and Maxx 2 in a new leaked high-resolution image. Last weekend we saw information on these two devices appear from a leaked pamphlet, and more recently we gave some further details on the Droid Turbo 2 from a leaked Verizon information sheet. While we’ve seen leaked images of the phones on a few occasions, the new high-res image gives us a really good look at the devices and various color options. A prominent leaker of upcoming devices is @evleaks, and the majority of the information that comes from this source turns out to be the real deal. Therefore while we cannot verify this image it does look highly credible, and it ties in with what we’ve been expecting and previous leaks on the Droid Turbo 2 and Droid Maxx 2. 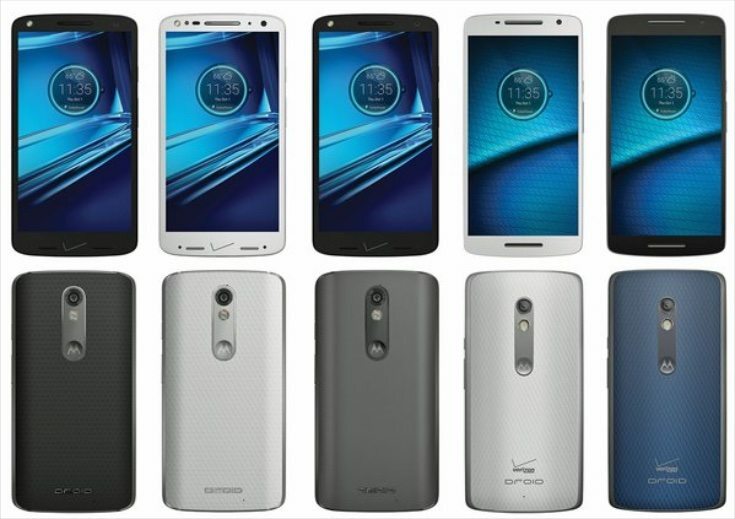 The image shows the fronts and backs of 5 handsets, with the Droid Turbo 2 in the first three positions from left to right. The other two handsets shown are said to be the Droid Maxx 2. You’ll notice that on the Droid Turbo 2 the Verizon branding is on the front and the Droid branding is on the reverse. On the Droid Maxx 2 both logos are on the back of the handset. All of the phones shown in the image have black or white fronts and a selection of differently colored panels on the reverse. The Droid Turbo 2 backs are texturized for two of the handsets and smooth for the third. Of course more options could be available as suggested by the two recent leaks linked to above. One thing we can be sure of is that we’ll bring you the official gen on both of these handsets from the launch on Tuesday so do check back with us for more. In the meantime we’d like to know what you think about the upcoming new Droids. Are you more interested in Motorola’s Droid Turbo 2 or the Droid Maxx 2?